I thought that it would be hard to top Week Two of Southern Belle in the 'Bunk as my favorite week of this series, but this week's post might have just stolen my heart. I do have acknowledge of course that the beautiful photography for both this week and Week Two was done by my dear friend Katie! She sure knows he way around the camera, doesn't she? Blue is my favorite color. Specifically, my favorites shades are Tiffany blue/aquamarine, or sky blue. Yet whether I like it or not, I always seem to find my way back to this bright blue shade that I'm wearing in this beautiful dress from eShakti. Bright blue and white were my high school's colors, and azure blue and white (such a specific shade of blue :-) ) are the colors of my sorority, Alpha Delta Pi! So when I saw this dress on the eShakti website last month, I knew that it had to be mine. 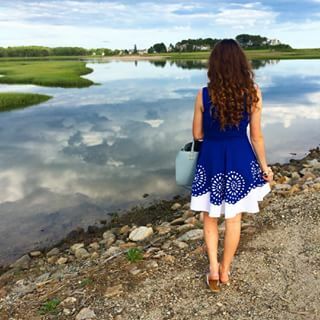 Not only is it the perfect summer sundress because of the lightweight feel and the beautiful embroidery, but it seemed perfect for me since it came in my "true colors." Sadly this dress is now sold out, but eShakti has tons of other beautiful summery sundresses that would be perfect for the end of the summer season! They almost always have some sort of a sale or promotion going on, so definitely give them a visit. You can also check out this blog post from last summer, from when I styled a different eShakti sundress (which I still love and have been wearing this summer as well!). I also want to note that the bracelet that I'm wearing, from an online shop called Swell Caroline (I did a blog post with them a few months ago! ), is currently on serious sale! This bracelet has become one of my favorites for summer, and it's available in five colors!! It does run a little large- just as a heads up! But I would say that I have an average wrist size, and I'm still able to enjoy wearing it! It matches and coordinates well with so many things, and I always love adding a touch of florals to any outfit. I have linked some other beautiful sundresses in these colors at the bottom of the blog post! During the first week of Southern Belle in the 'Bunk, I did my post on a bridge that crosses over one of the rivers in my town, the Mousam River, at a spot that's very close to where it meets the ocean. The photographs for this post were taken not even a mile away from where Week One's post was done! There is a beach right near where the Mousam River meets the ocean called Parsons' Beach. Technically it is a private beach, but the owners of it are gracious enough to let the public use it! It has a far more natural feel then any of the other beaches in town. My parents and I used to enjoy going there more when I was younger, but parking is very limited at Parsons' Beach, and once I got older most of my friends in high school always preferred going to the larger beaches in town, so that is where I always seemed to end up. Shooting these photos this week made me rediscover my love for this darling area though! And yet- I never even made it onto the beach for this shoot! Parsons' Beach has the most beautiful long, tree lined drive leading up to the beach and parking area. There is also a small horse farm and fields on both sides of the road, past the trees. When the lighting is right, it is truly the most scenic sight. I don't think that this will be the last time that I do blog photos here! Stay tuned for more Southern Belle in the 'Bunk coming next week, and tomorrow I'm sharing my first travel recap from France! The product reviewed was gifted to me for review purposes on my blog by eShakti. All opinions are honest and my own. That dress is so ladylike, and the fields make me wanna go there and lie down doing nothing, so peaceful! Absolutely in love with that dress, you look great - that blue is a wonderful color on you! This dress is so beautiful on you! 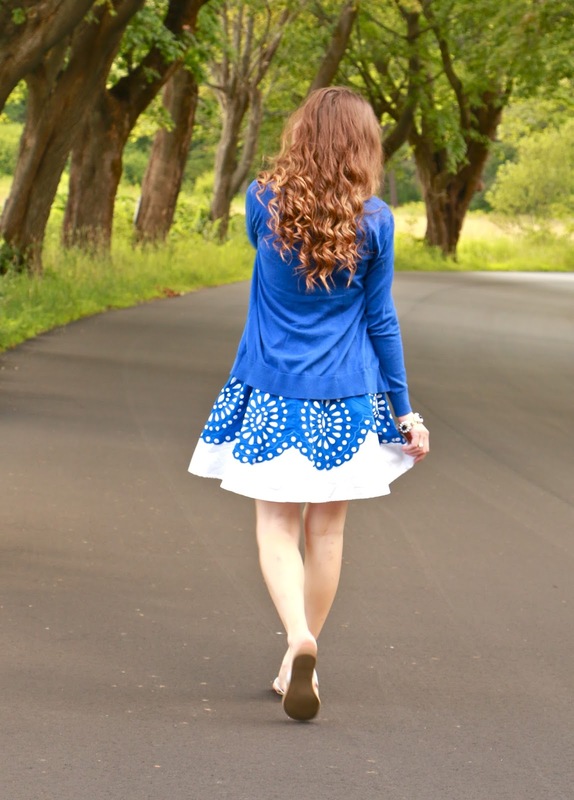 I love blue this summer -- especially blue and white. Your hair also looks so full and perfect. That dress is STUNNING! Omg. Totally swooning over it! Not to mention, your hair is seriously perfect! Maybe I'm biased, but I've always thought brunettes look great in royal blue. I love that dress. You look amazing as always Annaliese! Love these pictures! Your hometown is absolutely gorgeous. I love that color blue on you! Your hometown is gorgeous and so are you! Love your hair in these photos... it's gorgeous! You look incredible in these photos! Blue is so your color!! I love your dress and your hair looks incredible! This dress is so cute! I could definitely wear it to work and out! Ahhh, this dress is so stunning! I'm in love with this, it is perfection!! What a beautiful photoshoot! The blue really pops against your skintone. Love the look! GORGEOUS. Cobalt blue is your color, girlfriend! Absolutely love that dress on you, and your hair is goals.